Game shooting at Dornells, Dumfriesshire. The Scottish have a delightful way of describing any day that suffers from inclement weather. The word ‘soft’ takes on a whole new meaning as the rain drips off the end of the muzzles. However, such inclement weather was not going to distract Dornells estate owner William Robinson, his family or friends, from enjoying a day’s sport in the Scottish lowlands. The guns drew their pegs over a breakfast served in the vast conservatory of Dornells House, as the drives were confirmed between William, his son Mike, estate manager Francis Hood and headkeeper Mark Rodgers. The four men knew the birds had to be up to scratch, and so they were, flying high and fast on Lochengower, over guns lined out along a narrow track with tall trees and thick bracken at their feet. The birds were strong throughout, disappearing every so often into the mist,while the ghostly sound of chanting beaters hung in the air. Long Hill is a drive known to produce staccato flushes as the beaters bring the hill down towards a stream and fields where the line awaits. Pockets of birds funnelled down from the woods into the thick, natural cover that cloaks the high knoll in front of the line. The mid-section of the beating line pushed the birds onwards towards the trees, the birds fanning fast, high and wide. Lockhart is one of Dornells’ signature drives, known for its towering birds. They can be seen from afar and though guns can track them it means that they often miss them behind. Guns were pegged out with their backs to a line of trees on the banks of the stream running through Long Hill, with one long stop and three back guns. Away in the distance, the copse on the far hill was alive with pheasants and the flagmen on the slope were ready to encourage them even higher. The shooting was spontaneous, each gun swiftly looking skywards, selecting their birds and folding its wings in one quick movement before reloading and waiting for the beater’s distant cries, the gun’s eyes turned downwards. A drive well controlled by Mark and his team, flush after flush broke cover over a sustained half hour’s shooting. All that remained after lunch was Home Wood, notorious in the estate’s shooting repertoire. Interestingly, many guns could see their pegs from within the house, three of the positions set out along the house’s formal gardens. Pegs were also placed just to the rear and up into the kitchen garden around the rockery. A drive that can easily be manipulated, the higher reaches of Home Wood were pushed through, producing the right amount of birds to meet the bag. Beaters performed very well in the awful weather. Although it was just the top of the drive that was brought into play, Mark and his team produced treetop, fast flying pheasants with enough speed and agility to test the gun’s resolve. Dornells is, in many ways, a relatively new estate. Situated 28 miles west of Dumfries, it is the amalgamation of four large farms. 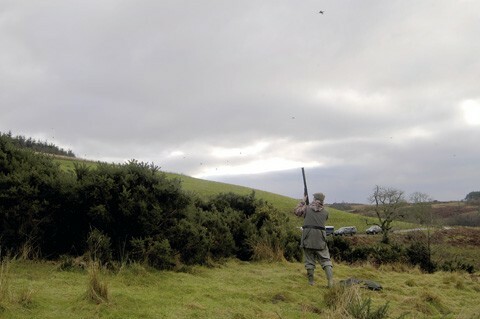 No longer agricultural, the land is now given over extensively to shooting, and each of the preceding owners have added significantly to the estate’s reputation for quality sport. Taking its name from one of the original farms, around 1,000 acres of its 2,100 acres are dedicated to shooting. 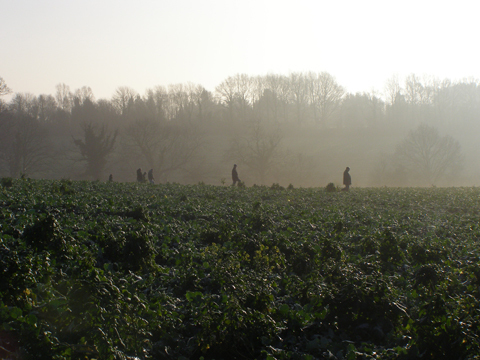 Strategically planted woodlands and game crops co-exist with livestock and an extensive roe deer herd. Dornells House is a development of the original 18th century farmhouse. Previous owners have added extensions, additional floors and rooms, along with the large conservatory that looks out over the gardens, Home Wood and the lower of the two fishing lochs. For many keepers, being in charge of a large, prestigious shoot is a lifetime’s ambition. For Mark Rodgers things couldn’t be more different. Once the headkeeper at Bowhill estate near Selkirk with a number of keepers and shooting personnel under him, Mark, now in his third year at Dornells, realised he had become more a man manager than a true gamekeeper. It had eliminated the reason he went into the profession over 38 years ago. Starting out around Lincolnshire as a teenager, Mark has gradually moved northwards. “When I arrived here I told William and Francis it would take me at least three years to learn the ins and out of the estate, instigate new plans, enhance existing drives and develop ones for the future. Big drives combined with sympathetic development are what I know, and this was something Dornells was keen to capitalise on. The Robinsons play an active part in the furtherance of the estate. Their son Michael has become an invaluable member of the keepering team. Their management of the administration allows me to concentrate on my job. Home Wood can be as short or long and as hard or easy as Mark Rodgers needs it to be. Running north to south just to the left of the house, the main wood runs along the left-hand side of the driveway with the guns facing west, irrespective of their peg position. If it’s the full drive that guns want, the woods are initially pushed from the most southerly point until the birds are evenly distributed. From there birds are driven in an easterly direction until they flush up and over the trees, high above the house and onwards towards the far woods, streaming over two fishing lochs and boathouses. The difficulty comes when birds are only seen for a fraction of a second before the driveway’s and garden’s more ornate flora and fauna remove them from the guns’ sight. Fast, yet extremely accurate snap shooting is required if substantial numbers are to be added to the bag.